More than just a pretty flower. Humans have long taken advantage of the huge variety of medicinal compounds produced by plants. Now MIT chemists have found a new way to expand the pockets of Big Pharma by producing genetically engineered plants yield unnatural variants of their usual products. Now MIT chemists have found a new way to expand plants’ pharmaceutical repertoire by genetically engineering them to produce unnatural variants of their usual products. The researchers, led by Associate Professor Sarah O’Connor, have added bacterial genes to the periwinkle plant, enabling it to attach halogens such as chlorine or bromine to a class of compounds called alkaloids that the plant normally produces. Many alkaloids have pharmaceutical properties, and halogens, which are often added to antibiotics and other drugs, can make medicines more effective or last longer in the body. including the anticancer drug vinblastine. The team’s primary target, an alkaloid called vinblastine, is commonly used to treat cancers such as Hodgkin’s lymphoma. O’Connor sees vinblastine and other drugs made by plants as scaffolds that she can modify in a variety of ways to enhance their effectiveness. 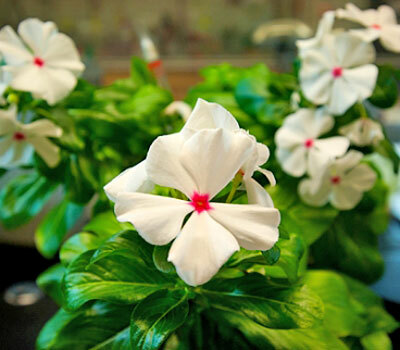 O’Connor, graduate student Weerawat Runguphan and former postdoctoral associate Xudong Qu describe their engineered periwinkle plants in the Nov. 3 online edition of Nature. The research was funded by the National Institutes of Health and the American Cancer Society. Engineering new genes into plants has been done before: In the 1990s, scientists developed corn that could produce an insecticide called Bt, which comes from a bacterial gene. However, O’Connor’s approach, known as metabolic engineering, goes beyond simply adding a gene that codes for a novel protein. Metabolic engineers tinker with the series of reactions that the host organisms use to build new molecules, adding genes for new enzymes that reshape these natural synthetic pathways. This can lead to a huge variety of end products. Most metabolic engineers use bacteria as their host organism, in part because their genes are easier to manipulate. O’Connor’s work with plants makes her a rare exception. “there has been a lot less effort to engineer plants to produce things that could be of even more value,” says Edward Eisenstein, associate professor at the University of Maryland Biotechnology Institute. On the other hand, the complexity of plant synthetic pathways means that in many cases, it may be easier to modify the plant rather than try to reconstitute the entire plant pathway in a different organism such as bacteria. “This is a very nice study that might get more people to think about engineering plants rather than using them as a source of genes,” says Eisenstein, who was not involved with the research. In previous experiments, O’Connor and her students induced periwinkle root cells to create novel compounds by feeding them slightly altered versions of their usual starting materials. In the new study, they engineered the cells to express genes that code for enzymes that attach chlorine or bromine to vinblastine precursors and other alkaloids. The two new genes came from bacteria that naturally produce halogenated compounds. It’s much more rare for plants to generate such compounds on their own, said O’Connor. It is also possible, though very difficult, to synthesize halogenated alkaloids in a laboratory. To make alkaloids, plants first convert an amino acid called tryptophan into tryptamine. After that initial step, about a dozen more reactions are required, and the plants can produce hundreds of different final products. In the new genetically engineered plants, a bacterial enzyme called halogenase attaches a chlorine (or bromine) atom to tryptamine. That halogen stays on the molecule throughout the synthesis. In future work, the researchers hope to engineer full periwinkle plants to produce the novel compounds. They are also working on improving the overall yield of the synthesis, which is about 15 fold lower than the plant’s yield of naturally occurring alkaloids. One way to do that is to introduce the halogen further along in the process, said O’Connor.